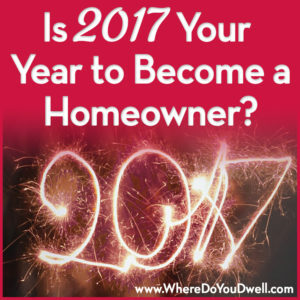 Is 2017 Your Year to Become a Homeowner? A new year always brings with it new changes and new goals. And, could that mean a new home for you in 2017?! We saw a recent CNBC article that said not buying a home is the single biggest mistake millennials are making. Don’t let that happen to you. If you plan to put “buying a home” at the top of your resolution list, then you need to start pre-planning now to jump start the home-buying process, especially if you want a home by springtime. Plus, there are predictions that mortgage rates may increase as the year progresses. Buying a home takes a lot of preparation. It’s important to get your finances in order and complete other tasks before you even start house hunting. This early pre-planning stage of the buying process doesn’t happen overnight. It takes time on your part even while working with an agent. Once you’re ready to actually buy and make an offer, you should be able to make decisions quickly and confidently since you are well prepared. As a first-time buyer, it’s very important to become educated about buying a home. You want to truly understand what it takes to buy and own a home before you even start seriously looking. Learn about mortgage options. Do you understand how mortgage rates work, such as fixed rates or ARMS? Or the difference between a FHA loan and a conventional loan? Learn what’s available now and even the outlook for rates in the coming year so you aren’t overwhelmed or surprised later on. This way you can determine what type of financing will be best for you. Meet with an agent and a mortgage broker for a review of what’s available right now. Explore neighborhoods and open houses. Check out certain neighborhoods in terms of cost and features of homes. Internet sites such as Realtor.com or MLS.com will include open houses and current listings. Actually walking through homes can help you explore your wants and needs in a more direct manner. Get a better feel of what’s important to you, such as location, large kitchen, backyard, open-concept, or size of rooms. With condos, you’ll also get an idea of monthly HOA fees and amenities in different buildings. This time spent “scoping out” homes provides a reality check and will make you more efficient when it comes time to really house hunt! Find out about assistance programs for buyers. Did you know that there are government assistance programs that can make buying a home much more affordable? You’ll be amazed to see what is available for mid-income buyers, first-time buyers, veterans etc. Programs from local housing authorities can help with down payment or low interest loans; and many buyers can qualify for this assistance. Don’t disqualify yourself before you try. We can go over what’s available in the DC metro area with you. For example, did you know that in DC if you make less than $85k per year you qualify for some down payment assistance? That’s essentially FREE money for you to buy your first home. Learn more here: How To Get Up To $80K For Your Downpayment! That’s just ONE of many programs available to buyers in the DC metro area! Accept you have a learning curve to face. Everyone has been in your shoes before, so don’t be embarrassed if you don’t know everything. No matter what, don’t be afraid to ask questions. Meet with a realtor or a mortgage broker for an information gathering session. Or attend a home-buying seminar to get more acquainted with the process. Check out real estate sites or columnists or articles in the media. Buying a home is probably THE biggest expense you will ever have in your life. You want to be a responsible buyer and homeowner, so now is the time to focus on your finances. Don’t do anything that could disrupt your good credit! Strengthen your credit score and build credit history. Your FICO credit score is your gateway to a good mortgage since lenders use it to determine your risk as a borrower. So the higher your score, the better your loan options. And, if you’re a couple, then BOTH of you will need to work on your credit! It can take 6 months or more to improve your score, so start today. Pay your bills on time, don’t take on any large debt, and double check your score for inaccuracies. Work backward from your desired monthly payment to calculate the price range you can afford. We can show you how to budget for a home and determine what you can afford. Learn more about how to figure this out here: What Should Your Monthly Mortgage Payment Be? Save for a down payment. Cut expenses and save, save, save (maybe find a high-yield savings account) right now! No matter if you get a 3% down loan or a conventional 20% down loan, lenders still want to see if you have enough cash reserves in the bank. Remember, owning a home isn’t only its purchase price but includes other costs such as taxes, insurance, maintenance, and possible HOA fees. With a larger savings account, a lender knows you’re financially responsible and less of a risk. During this time, you can even “play house” and see how you handle living with your “affordable” monthly mortgage payment. Can you handle it? Revisit your lease agreement. If you’re a renter, take a look at your lease to see when it comes up for renewal. Find out if you’ll be hit with any penalties if you terminate it early. Maybe you can time buying a home so that it comes close to that date. Or, give yourself a goal and use that date as an inspiration (or deadline) to get things in order so you can buy a home then. You need to avoid some risky actions that could derail your ability to get a mortgage loan. Ignoring just ONE of these items can ruin your chances for qualifying for the loan you want. As you can see, start planning now if you want to buy a home this year. You’ll be a more informed buyer and borrower, and will be ready to purchase a new home with confidence and less stress! Every home buyer is different and we want to help you walk through these steps in the way that’s right for YOU. Email jennifer@wheredoyoudwell.com to set up your private discussion to learn about what’s best for your particular budget and goals.